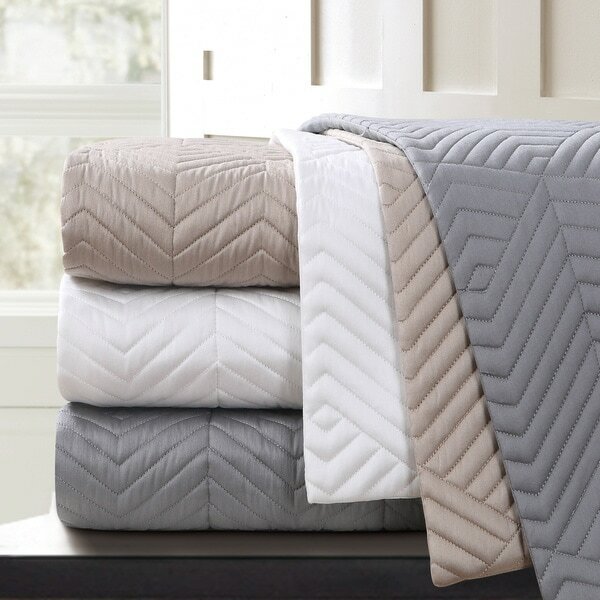 Keep your pillows protected from stains and looking stylish with these quilted cotton Euro shams. Constructed from 100-percent cotton sateen, these shams offer a durable zipper closure on the side and is conveniently machine washable. The Echelon Euro Shams comes with a five (5) star rank. I've had this set in white for over a year. Unlike other shams having the envelope style of opening these have hidden zippers so they can truly be reversed to the other side. There're holding just a fine as the day I first used them. I would definitely recommend them! 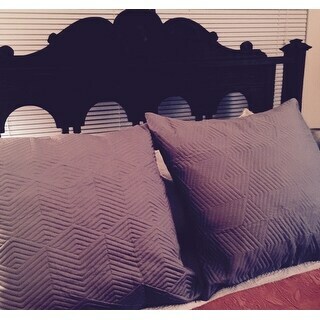 The white quilted shams fit perfectly on my euro pillows. Quilted look adds a luxurious feel and look to the master bed. Love the zippered closure and am ordering more in other colors! Very nice stitching quilted pattern-goes with any print or design on beddings. Just received these last week and I absolutely adore them! The material is so soft and it is such an elegant pattern. I've been searching everywhere for euro shams and anything remotely this nice was around the $*/ea range! This was a steal! Will be looking into getting the matching sheets soon. I liked the design of these shams. They accent the bedspread and is of ok quality. One zipper seam was pulled out. I will keep as once the sham is inserted it is fine and the zipper will be used only to wash occasionally. great quality large euro shams! i wanted two large euro sham-sized grey pillows on my sectional and these covers fit the bill perfectly. i like the added bit of texture/dimension they provided. Really nice geometric design and also very soft. I especially appreciate the hidden zippers on these shams. Many shams (even very high end expensive ones) have a fold over pocket and the pocket never stays shut so this zipper (if it hold up) is a nice added bonus. We washed them straight away and they did not shrink. The color is also very nice, a light slate gray. I was very happy to find out my monitor displayed the color correctly. Would recommend. Just love my Monterey Quilt Euro shams they just look so beautiful on my bed would highly recommend to a friend. Happy with these true gray, subtle matelasse texture Euro shams. These are half the price as similar quality shams in stores. Clean lines so suitable for men and women. I'll have to remember to wash these in the gentle cycle as I'm unsure how the hidden zippers will hold up. The only shams I've had are the envelope non-zipper type. Overall, quite happy with the Euro shams. Thanks again, Overstock! Great shams to match quilt. I also purchased the euro pillows. Made Pretty well and a Nice shade of Gray. Zippers r a little hard to work so thats why this is not a 5. Haven't laundered these yet, but they have accurate color to ad, and are nice quality for the inexpensive price. I would order these again. Got the exact color which I was looking for. Material and quality is good. love these...very soft and quality seems good so far! washed very well. Worked well. Pretty good quality. Needed a pair of white shams and got them. They are good quality but I took off a star because they are all way too overpriced for what is a square of material with a zipper. I love the texture and the grey colorbis true to picture. The textured side is a bit thick (from the quilt like texture( which is a good thing). It has a zipper and looks very well made. They wash very well. Bought these in white. I love the quilted side of the case, but the reserve is a bit cheesey, but acceptable. I will enjoy it. The product has a clean tailored look. "When do I pick a color would like taupe"
Hello, Taupe is now available but with limited available quantity. Thank you. "Will you be restocking the taupe?" Hello, We will not be restocking taupe. Thank you. "Do the gray shams have a shine to them, or is it a flat color? " The grey shams have a slight sheen and are beautiful. I bought two for a guest room and liked them so much I bought 6 more for the back of a day bed in my office. They are a nice full sham and I used 2 IKEA Euro pillows to fill each....classic look. "I need this sham in white. When will it be available ?" We hope to restock the "white" if it becomes availalbe again. We cannot guarantee it will be restocked. Please check back with us periodically. "Does this price include the euro sham with the pillow inside or just the euro sham?" Hello skallen, this is just the price for the sham. Thanks for shopping with us! "Is there any purple hue in the taupe?" Hello jstanch0, no there is no Purple in the Taupe. Please let us know if you have any further questions.